Eugene Flinn - South Dade Updates: POD - Bike transportation - not sport - along 82nd Avenue. Will I get a response to my request? Dumping $1 million? POD - Bike transportation - not sport - along 82nd Avenue. Will I get a response to my request? Dumping $1 million? Here is the photo of the day. Clearly this is a person using their bike as transportation, not competitive racing (I applaud her for leaving the car at home and enjoying the weather). DANGEROUS DRIVERS: Take a careful look at the photo (which was taken by the passenger, not the driver, in a car moving at a safe speed). I ask you, who is not operating their vehicle in a safe manner? It is the driver of car which you can see to the left, who is racing to make a light. This driver improperly passed the photographer's car by crossing a clearly marked double yellow line. This is the kind of driver that cyclists need to be protected from. Bike lanes would offer significant protection. What if this cyclist was a child on her way to middle school? This photo was taken within blocks of both Southwood Middle School and Coral Reef Elementary. Bike lanes improve community safety. The 2014-2018 Village Council was well on its way on completing the bike lanes planned for 82nd avenue, but effort this has come to a screeching halt, without comment. I want to clear up much of the official misinformation that bike lanes are a perk for the "spandex crowd" (a derogatory code word for those who bike for exercise or fun). This photo shows who is not a competitive racer who is simply biking for transportation - and who has lawful use of the road. CLICK HERE to see prior, related posts on the Complete Streets program. WILL PALMETTO BAY GIVE BACK $1 MILLION GRANT THEY GOT FOR ROADS? I am still waiting for a response to my prior post and request of November 21, 2018, Follow up – requesting status of the $1,000,000.00 TAP grant, will the new council follow through to maintain our priority for bicycle lanes, attempt to repurpose the money or reject this grant? It is decision time: Bike lanes or not, safe streets for our kids or not? 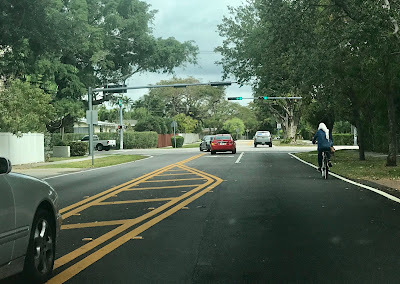 Follow through with the Palmetto Bay Traffic Master Plan and Bicycle and Pedestrian Master Plan or not? I simply asked whether the new council will follow through on the efforts revived in 2015 to complete the Bicycle & Pedestrian Master Plan (as well as accept or return the $1 million grant) or a will there be change in council policy? One million dollars is a lot of money to give up just to spite those who want to use bikes in a safe manner.